YOUNG, URBAN AND CURIOUS: VALPO’S MODERN MAPUCHE. 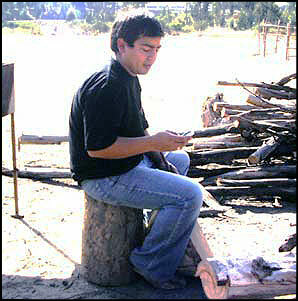 Ivan Melilla Raimil, preserving his ethnic identity in modern Chile. “Oh, I thought you’d be taller. Normally gringos are so tall,” is the first thing Ivan Melilla Raimil, 27, says to me when we meet in Valparaíso’s Plaza Aníbal Pinto. “But you’re like us,” he says, sounding somewhat relieved. We’ve met to discuss a project that he and other members of Newen Weche Mapu (Fuerza Joven Tierra) – a group of young Mapuche activists from the Universidad de Valparaíso (UV) – are just about to kick off. The project is directed towards Mapuche recipients of indigenous scholarships in the UV, and aims to increase cultural participation and understanding of identity in this group of urban young people. As Melilla explains, he discovered whilst interning at CONADI (the National Corporation for Indigenous Development) in 2004 that most people who came there to claim the indigenous student scholarships were completely uninvolved in and uninformed about indigenous issues. “They identified themselves as Mapuche just to get the scholarships, nothing else,” he says. So Melillan and a group of Mapuche friends from the UV formed Newen Weche Mapu, and began dreaming up ways of trying to get young Mapuche interested in and proud of their indigenous origins. They’ve already held Mapuche New Year celebrations and various workshops on aspects of Mapuche culture. He says there is still a lot of shame around admitting one’s indigenous origins. “If you have the surname Rodríguez, you look for the Rodríguez shield, the part of Spain it comes from, all that stuff. But the other part of our heritage, the Mapuche part, is not recognized." Melilla sees the source of this phenomenon in the vast “exodus” of Mapuche from their ancestral lands. That exodus began with the so-called “Pacification of the Araucaria” in 1883, the battle after which Mapuche lands were reduced to U.S.-style “reservations.” With insufficient land to continue their traditional existence, vast numbers of Mapuche migrated to the cities in search of jobs. Once there they took on the lowest posts in urban society, working mostly as maids and laborers. There were also obliged for the most part to suppress their origins – even abandoning their surnames and inventing new Spanish ones to avoid discrimination. Melilla’s mother was one of these maids. She left her rural home at age nine to work in Santiago. “I never saw her. I was brought up by my aunt and grandmother,” he says. While his family told him to be proud of his “indian” origins, those who still knew Mapudungun (the Mapuche language) never saw fit to teach it to the younger generations, so devalued was it in urban Chilean culture. Of the government, Melilla remains sceptical. “Sure, there have been Mapuche people in Parliament, but they always become too partisan – they worry about the wellbeing of their party over that of their people.” His only hope is that global pressure on Chile to comply with the various international conventions on the treatment of indigenous people which it currently ignores will have some effect. He’s also crossing his fingers that on May 21, when Chile celebrates the anniversary of the Iquique naval battle, President Michelle Bachelet will, “after spending half an hour talking about military spending,” devote a minute or two of her speech to the nation on indigenous issues. During the launch, Melillan and fellow Newen Weche Mapu member Sergio Millaman explain the structure of the project to the gathered 19 to 22-year-old Mapuche students. They will hold a series of weekly workshops for the next three months, addressing topics such as the Mapudungun language, Mapuche history, cosmology, food, and indigenous law. By the end of the project they hope the young people involved will be sufficiently prepared to run the course for incoming Mapuche students the following year. A man in the audience wants to know why the project is only open for Mapuche – and only Mapuche who can prove their origin, thus being eligible for the scholarships, at that. There are lots of non-Mapuche and “uncertified” Mapuche, he says, who might also be interested in the issue. He doesn’t see this as a negative form of discrimination. “I say, well, maybe its OK for Chileans to feel discriminated against for once. The Chilean constitution says we are all Chileans. But there are a lot of indigenous people who don’t feel Chilean,” says Melillan. On Saturday, the group meets in the Mapuche Cultural Center in the Botanic Gardens on the outskirts of Viña del Mar. There’s a ruka (a thatched teepee-style house), some wooden tables sheltered by an awning of branches, and the remains of a campfire, on the edge of a large flat expanse of dirt with a wooden carved figure in the center. While Melilla’s mother and sisters cook sopaipillas (fried flour fritters), the rest of the group starts to play with the Mapuche instruments that have been brought along – drums, seed rattles, a coiled horn. No-one is an expert. “I can only play PVC pipes,” laments one girl, trying and failing to make the horn sound. “Hey, but we don’t have a trompe (Jew's harp),” says someone. Melilla pulls out his cell phone – the ring tone is a trompe – and people start playing in time with it. As the bus pulls out of the cultural center, Melilla jumps up and plays tour guide. “To your left you can see a settlement of the Mapuche, a people who used to live in Chile. They are now extinct. If you (pointing at me) had gone there, they would have eaten you,” he grins cheekily, tossing me a handful of piñones (toasted Araucaria pine seeds) for the ride home.